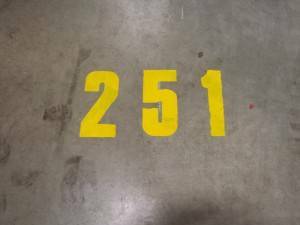 Why are indoor warehouse markings important? 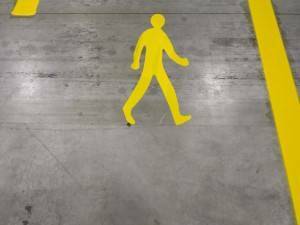 Introducing safe systems at work makes a considerable difference to the workplace, allowing the workflow to run smoothly, efficiently and safely. 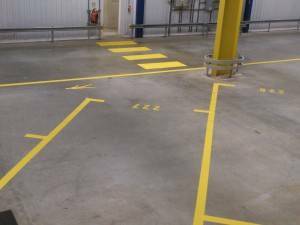 These systems include internal walkways, pallet lanes, equipment parking lines, drive-through hatching areas, lettering and arrows. 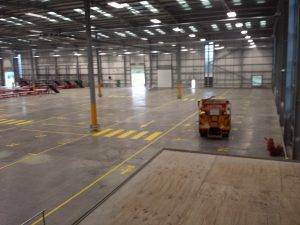 Our experienced operatives can assist in helping our clients utilise available space to its full potential, also ensuring the correct products are applied to varied surfaces. 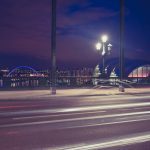 At Anglo Liners, we are committed to a full nationwide coverage, including major cities like London, Birmingham and Manchester. 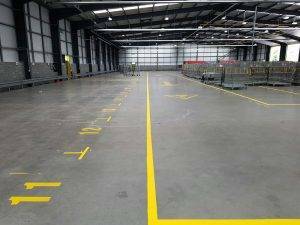 It is this commitment which makes us the warehouse marking company of choice for so many businesses across the UK. 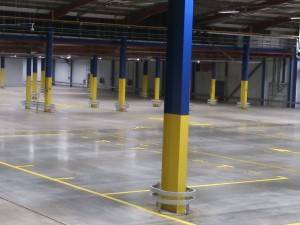 By offering our warehouse marking services around the clock, we guarantee the least amount of disruption to your business. We can work to the tightest schedules to ensure that we always meet your deadlines.